Continuing in my series on solar power basics, in this article we’ll take a look at solar hot water – the benefits of heating water via the sun, how it works and the costs involved. One of the most energy intensive (and therefore costly) processes in any house is the heating of water. Heating water accounts for more than 20% of residential energy use in the USA and around 40% of energy used in Australian homes. This represents not only a massive chunk of your power bill, but also a substantial proportion of carbon dioxide emissions. A solar hot water system, over a period of time, will save you money and lessen your environmental impact. Passive: A passive system consists of a tank for hot water storage, a solar collector, piping and frame. The entire system is mounted on the roof. Water heated by the panel flows upward naturally and then is gravity fed into the house. A flat plate collector is the traditional type and consists of an insulated box containing a black sheet of metal with embedded pipes. The heat is absorbed by the sheet and transferred to the water in the pipes. An evacuated (or vacuum) tube collector consists of glass tubes with a layer of heat absorbent coating through which water pipes run. As the tubes encasing the water pipes are a vacuum, this reduces heat loss; making them more efficient than flat plate collectors; so these are particularly suited to colder climates. While evacuated tube systems are a little more expensive than flat plate, their increased efficiency (up to 97% thermal energy retention) more than makes up for the added cost. 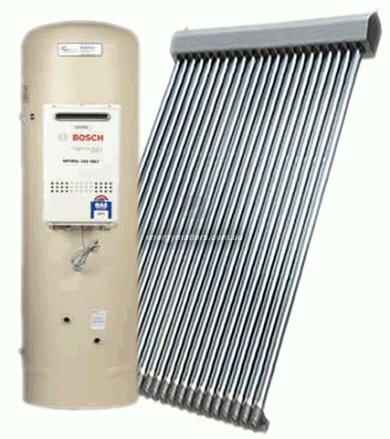 Heat pumps are a form of solar hot water technology that don’t use any sort of collector. Heat pumps use heat in the air to raise water temperature – even in freezing conditions down to -10 Celsius (14F). A heat pump is like a refrigerator, but in reverse. I’ve spoken to a few people who have these units, and even in the depths of winter they’ve had no problems with a steady supply of hot water. What about when it’s cloudy? While a solar hot water system can still warm water on cloudy days; if the cloud is too heavy for too long, the effectiveness of a flat plat system and to a lesser degree, evacuated tubes, is greatly reduced. For this reason, many solar hot water systems also come with an electricity or gas assisted system whereby if the temperature falls below certain point, the backup system automatically kicks in to maintain the desired temperature. What about the equipment’s environmental footprint? Renewable energy naysayers are quick to point out that the production of renewable energy equipment is an energy intensive process. This is quite true, however, given the equipment is designed to last a very long time, the amount of energy required to create the components is more than offset by the amount of energy it saves. While it varies with the type of system and location where it is used, a flat plate passive system energy payback time can be as little as 18 months. A solar hot water system can also save up to 4.5 tons of greenhouse gas emissions annually! Again, it depends on the type of system, but for a family of 4, expect to pay anywhere from $3,500 for an evacuated tube system to $4,000 for an evacuated tube system with electricity assist. In addition, you’re looking at between $1200 – $1600 to have it professionally installed. It’s a lot to outlay, but there’s ways to cut costs substantially. You can buy retrofit kits that can decrease the price by around a thousand dollars. The cost can also be dramatically decreased by taking advantage of renewable energy rebates that many governments offer. In some cases, rebates can be so generous they’ll reduce the price of a solar hot water system to make it comparable with traditional hot water services. To calculate an approximate payback time, deduct any applicable rebates and then take a look at your current electricity or gas bill. If you’re in the USA, calculate 20% of the bill as being attributable to hot water, or if you’re in Australia, take 40%, then divide the residual cost of the system by that figure. This will give you an approximation of how many months or quarters it will take to reach a stage that the system has paid for itself – after that, it’s basically free hot water heating up to around 25 years, when the system will likely need to be replaced. Solar hot water systems have been around for many years and are certainly not just a gimmick for hippies. The copious amounts of energy consumed in heating water has seen some governments make their installation compulsory. For example, Hawaii now requires all new homes to install solar hot water systems and in Israel, 90% of homes have solar water heaters installed. By the way, if you want to experience solar hot water for under 10 bucks, try a solar shower bag – I use one when I’m roughing it :). If you’re interested in learning more about other solar and wind power energy options, check out some of the articles listed below. DEET: Bad for animals too?